While re-running the computations testing the latest version of RStudio, I noticed something surprising – President Trump’s rally has advanced to 2nd place! A mere week ago, that seemed unthinkable. Something abnormal must have happened. Two things happened. First, the current stock market advanced another 2%. Nothing to brag about just another positive vote of confidence in the economy’s direction. Low and behold, no problem with the data, just a 7% drop on October 13th 1989. A quick search reveals that this was indeed Friday the 13th mini-crash! Friday, the 13th … mini-crash … What a coincidence! I will keep it brief and wrap up this post here. There were a few improvements and changes I did to the R code used to perform these analysis – the Gist contains all of them. It’s all optimism in the air, judging by the market behavior at least. 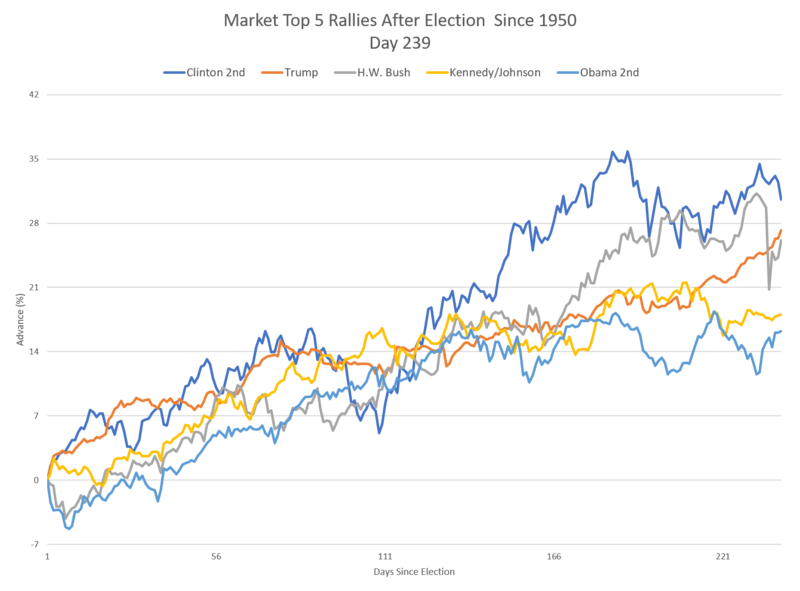 The post Markets Performance after Election: Day 239 appeared first on Quintuitive.